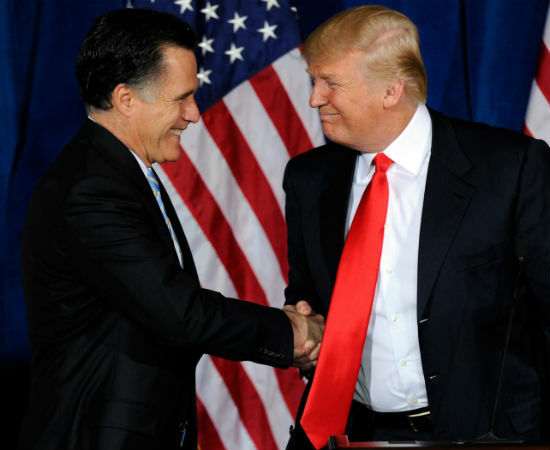 Donald Trump’s endorsement of Mitt Romney for President really shouldn’t be much of a surprise considering the startling similarities between the two men. I would have endorsed you earlier but I didn't recognize you without your jousting helmet. “Yes, all the candidates are millionaires–as any candidate for public office should be since donors don’t believe a man can be president if he isn’t well-connected enough to even accidentally stumble upon a million or two–but only Mitt can rival my level of wealth in the hundreds of millions department. He’s the only candidate who will tackle the lack of words to define the territory between millionaire and billionaire. ‘Millionaire’ is anyone with 1 million. ‘Multimillionaires’ is anyone with a minimum of 2 million. That’s chump change. Don’t lump me into the same category of wealth as a guy with 2 million. That’s what I spend on red power ties and hair care products in just one season of Apprentice, Sunday nights on NBC. Damn you, GG. I had declared a personal moratorium on looking at photos of rich idiots (I haven’t seen one photo of a Kardashian in over a week), and now this. My eyeballs have just lost brain cells. I didn’t want to comment on Trump’s endorsement since nobody can be held responsbile for whom Trump endorses, but I had to say something about someone who would actually accept Trump’s endoresement. I think that’s a fire-able offense. Now that it looks like Romney has the win, Trump wants to come in and endorse him so he looks like a power broker. In a similar vein, I’m waiting to make my endorsement until the day after the general election. They may actually be twins that were separated at birth. The hair, the suit, the ham-handed politics, the stupid statements. Romney is going to have to get married a few more times and start calling himself ‘The Mitt’ before I’m completely convinced. That’s a much more interesting name than the White House. It doesn’t exactly roll of the tongue, does it? I think Trump just endorsed him because he wants to know how Mitt gets that great hair. This handshake picture makes my soul wince. Can you imagine the kind of conversations these guys have? To be honest, I honestly can’t imagine any conversation these two guys could possibly have. I might start caring whom Puffy Combs endorsed if scientists were able to establish a connection between bling and world peace negotiation strategies. Don’t be surprised if Republicans automatically reject anything that sounds European. Just when I was starting to think the whole 99 vs. 1 thing was a media invention. . . . These pictures of the two together won’t do Romney any favors when the 99% issue heats up again during the general election. I use to work for the St. Louis Public School district until my job was outsourced. That,s when William Roberti, Alvarez & Marsal out of New York were hired for the 2003-2004 school district to turn the school around after we lost our accreditation. Seven years later we are struggling to achieve that. I understand Romney and Trump are great businessmen but it takes more than being a businessman to run a school district. I also wonder how the New Orleans school district,after Roberti, is doing as they also struggled to gain accreditation. So I hope Romney is not going to rely on the fact that he is a businessman and try to deal with education in such a way. We’re proof positive it doesn’t work that way. I am now very depressed! I hope I didn’t ruin it for you if either of these men had been your first choice for president. And yet Obama is the one called “an elitest” — which I now understand to mean “smart” and “doesn’t prefer domestic beer”. If Americans weren’t so unflinchly loyal to domestic beer, maybe beer companies would feel some pressure to make a good domestic beer. Despite that it’s grounds for deportation, I say bring on the Guinness! Those American lagers are barely even beers. You’ve got to get into ales before the world of beer opens up. 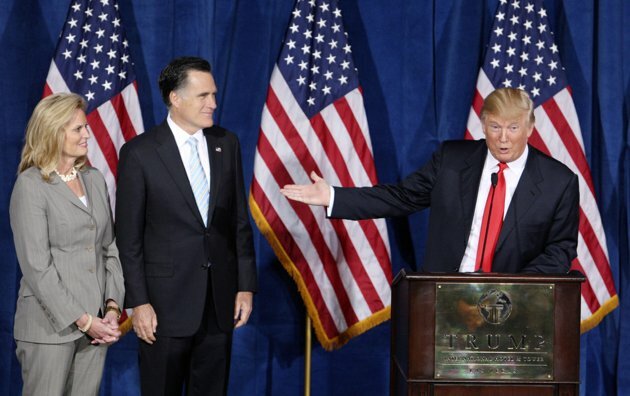 Romney seems pained in every picture with The Donald. I’m sure he didn’t want to be there. His advisors probably convinced him that even though the endorsement was meaningless, Trump would be a thorn in his side if he felt disrespected. 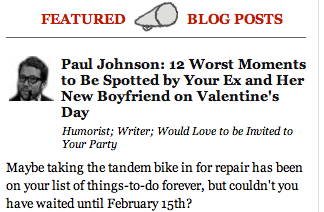 This is the third piece I have read on this blog that has been better than the monologues on the late night TV circuit. In fact, I recently found myself screaming (thinking to myself) while watching Letterman, “The Good Greatsby did a much better job making fun of Captain Schettino.” I think the late night set might benefit from a link to your blog. By all means, please send them a link. But just think how far Trump’s gotten with that haircut. I want to be a squinting billionaire when I grow up. Squinting billionaires have all the fun. At first I thought these were real Trump quotes, but then I noticed that for each one, you’d strung together one or more grammatically correct sentences to form a coherent thought. The real Donald Trump would never do that. But now I’m wondering which would have been less painful to watch: the current series of Republican debates or a season of Republican Presidential Candidate Apprentice. Laura, where do you come up with these great ideas? (RPC Apprentice) You need to be on the brainstorming panel! I am presuming that the endorsement comes with the caveat that the Donald can fire President Mitt at any time during his term if he is unhappy with his performance or if the ratings are low. I’m not gonna lie, I love Mitt Romney. Hopefully he’ll be our next president. The Donald is a self promoting, thin lipped, orange man with bad hair. The two are VERY different. Marvelous last paragraph. I imagine some people still won’t get it, despite your masterfully subtle presentation. But then, they’re the ones it’s working on after all.